miniOrange provides secure access to Freshdesk for enterprises and full control over access of application. Single Sign On (SSO) into Freshdesk with one set of login credentials. Secure your Freshdesk app from password thefts using multi factor authentication methods with 15+ authentication types provided by miniOrange. Our multi factor authentication methods prevent unauthorized users from accessing information and resources having password alone as authentication factor. Enabling second factor authentication for Freshdesk protects you against password thefts. The Enduser will be redirected to their Freshdesk account by clicking the Freshdesk icon on the Enduser Dashboard - there is no need to login again. 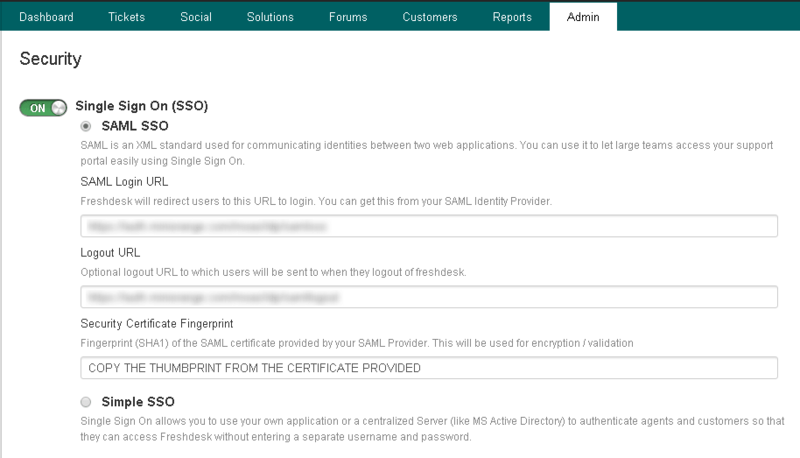 In SP Initiated Login, SAML request is initiated by Freshdesk. An Enduser tries to access their Freshdesk domain. They will be redirected to miniOrange Self Service Console. Here they can enter the miniOrange login credentials and login to their Freshdesk Account. Go to Apps >> Manage Apps . Click Configure Apps button. Click on SAML tab. Select FreshDesk and click Add App button. Make sure the SP Entity ID or Issuer is in the format: https://your_domain.freshdesk.com/login/saml. Make sure the Single Logout URL is in the format: https://yourcompany.freshdesk.com/support/home. Leave the Attributes section empty. Click on Save to configure FreshDesk. Click on Download Certificate link to download the certificate which will be required later. Login to your Freshdesk domain. Click on the toggle to turn ON Single Sign On (SSO). Security Certificate Fingerprint Copy the Thumbprint of the downloaded certificate. Open the certificate that was downloaded earlier. In the Field column, select Thumbprint. Copy the Thumbprint that opens in the pane by pressing CTRL+C (Right-Click wont work!). Paste the Thumbprint in the Certificate Fingerprint. Click the Save to save the Single Sign On (SSO) SAML settings. Login to miniOrange Admin Console . Go to Policies >> App Authentication Policy. Add a new policy for Freshdesk. Select Freshdesk from Application dropdown. Select a Group Name from dropdown - the group for which you want to add Freshdesk policy. Give a policy name for Freshdesk in Policy Name field. Click on Save button to add policy for Freshdesk Single Sign On (SSO). Step 3: Onboard users into our system. Go to https://[your_domain].freshdesk.com, enter your Email Address and click on Login. Now you will be redirected to miniOrange IdP Sign On Page. Enter your miniOrange login credential and click on Login. You will be automatically logged in to your Freshdesk account. Login to your miniOrange Self Service Console as an End User and click on the Freshdesk icon on your Dashboard. The most practical way to strengthen authentication is to require a second factor after the username/password stage. Since a password is something that a user knows, ensuring that the user also has something or using biometrics thwarts attackers that steal or gain access to passwords. Traditional two-factor authentication solutions use hardware tokens (or "fobs") that users carry on their keychains. These tokens generate one-time passwords for the second stage of the login process. However, hardware tokens can cost up to $40 each. It takes time and effort to distribute them, track who has which one, and replace them when they break. They&apos;re easy to lose, hard to use, and users consistently report high levels of frustration with token-based systems. miniOrange authentication service has 15+ authentication methods. You can choose from any of the above authentication methods to augment your password based authentication. miniOrange authentication service works with all phone types, from landlines to smart-phone platforms. In the simplest case, users just answer a phone call and press a button to authenticate. miniOrange authentication service works internationally, and has customers authenticating from many countries around the world. If you don't find what you are looking for, please contact us at info@miniorange.com or call us at +1 978 658 9387 to find an answer to your question about Freshdesk Single Sign On (SSO).